For foodies, Quebec is full of surprises. I had come to expect the innovative and delicious in the capital of French Canada, where there so many good restaurants you could stay a week and barely scratch the surface. But now I know you may also strike gold in the boondocks. So it was in Tadoussac. Tadoussac is some three hours’ drive from Quebec City along the north bank of the wide St. Lawrence river, navigated so brilliantly by Wolfe’s fleet in 1759, and a short car ferry ride across the mouth of the Saguenay Fjord. It’s well established on the tourist map. 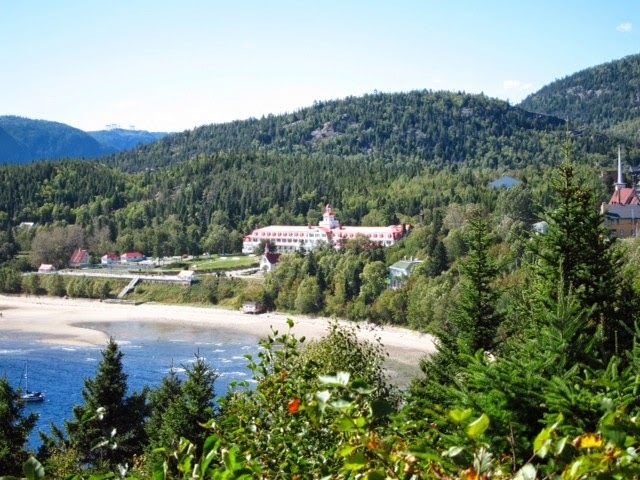 The orginal Tadoussac Hotel, opened in 1864, not long after the future King Edward VII was carried to safety when caught out by the tide while salmon fishing on the nearby Sainte Marguerite river. The hotel’s more recent, red roofed incarnation is still the town’s centerpiece. Visitors come for the whale watching and some, like us, for the walking. We combined both at Baie Ste Marguerite, not far from where the King got into trouble, in the Sagenay Fjord park. Well, we think we did. You can see the glinting backs of beluga whales from a look out platform there, though it can be to distinguish them from the whitecaps of chopped waves. This is the southernmost concentration of the mammals, whose ancestors became isolated from their Arctic cousins some 8000 years ago at the end of the Ice Age. Hiking high above the fjord I disturbed a bull moose, complete with majestic antlers, browsing by the trail. Before I could alert my companions it took fright, clattering off into the forest, defying our prolonged attempts to track it down. A little further up the St Lawrence from Tadoussac we descended a mighty sand dune and hiked back to town on the shore. The receptionist at the small hotel where we stayed had checked that the tide would be out. It was a walk of only about one hour but was memorable. 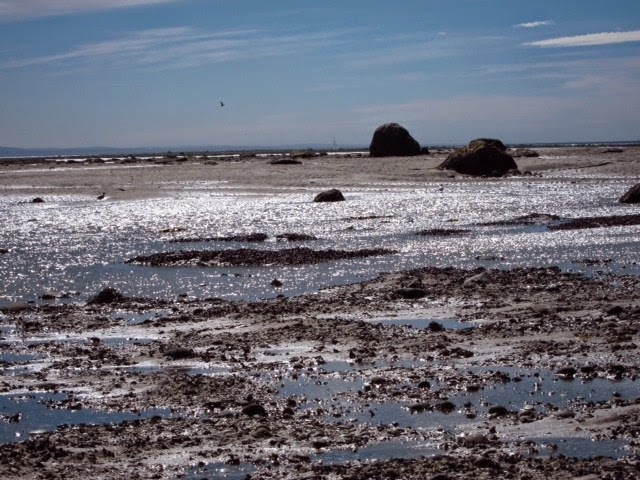 The wind whipped our faces, rock pools shimmered on the sand and shingle. Fresh air and exertion sharpened the appetite for a second visit to Chez Mathilde. A couple of nights earlier we had eaten there by chance. At first we were turned away (it pays to book) but having found nowhere else that had space or took our fancy we returned later, when a table had become free. It proved a worthwhile wait. My starter of lobster. shrimp and yellow beet, topped with smoked salmon was followed by a wild mushroom risotto so wonderful it had me purring with delight. My enjoyment was heightened when I asked the waiter to identify the fungus: two kinds of chanterelle and pieds de mouton, known in the UK as hedgehog mushrooms, she replied without a moment's hesitation. Other visitors have praised the crab, the lobster, the steak and stuffed quail. Me? After that hike by the St Lawrence I insisted we went back - just so I could eat that risotto again.